Define and streamline leadership, governance, and expectations. 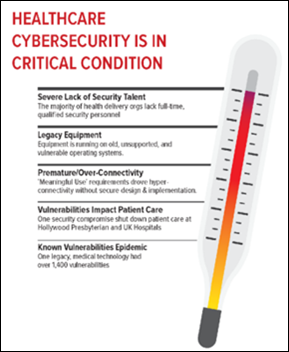 Develop the workforce capacity necessary to prioritize and ensure cybersecurity awareness and technical capabilities. Increase industry readiness through improved cybersecurity awareness and education. 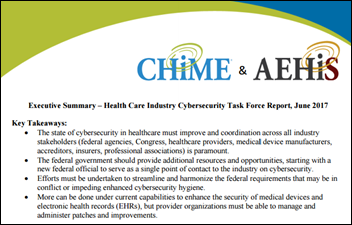 CHIME has published a far less intimidating 11-page summary of the report’s 100-plus recommendations. HHS officials have thus far been mum on the forthcoming HHS cybersecurity center’s role in fleshing out the recommendations. From Jet Blue: “Re: AirStrip Technologies. I met with a prominent venture capital firm today, and we discussed the many high-flying digital health companies that have been funded over the last few years. I learned that AirStrip Technologies has been acquired by Patrick Soon-Shiong, MD. He intends to combine AirStrip with his other companies such as ISirona and Harris CareFx. Apparently the deal is being kept under wraps.” Unverified. ISirona and Harris are among the eight companies NantHealth has acquired over the last six years. AirStrip has flown fairly under the radar this year, and issued just a handful of press releases in 2016. I interviewed President Matt Patterson, MD last March. From HIT Apostle: “Re: Integration. We are exploring different options for how to best integrate EHR data into our analytics product suite. This would include becoming HIPAA compliant, hiring an ETL team, and adding data processes to our operating model. Have you ever asked your readers what a ballpark figure cost is for this? Are there more cost efficient options, like working with an integration vendor, such as Redox?” I don’t believe I have, so I’ll invite readers to comment with advice and experiences. A HIStalk sponsor and Donors Choose supporter asked me to share this survey on EHR services. They plan to double their already sizable donation once they reach 100 responses. 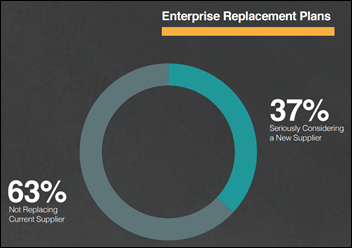 New poll to your right or here: Would you consider switching EHRs if your vendor was involved in a legal situation similar to that of EClinicalWorks? Feel free to add write-in commentary regarding what vendor(s) you would put at the top of your shopping list and how much weight certification would carry. Rumors surface – again – that McKesson is considering selling or merging its McKesson Technology Solutions business unit in the face of drug pricing pressures. Intermountain Healthcare, Stanford Cancer Institute, and Providence Health & Services launch a genomic data-sharing network. Vice President Biden forms the Genomic Data Commons, an open-access cancer database that will help researchers collaborate and share information, as part of his Cancer Moonshot. Practice Fusion settles with the FTC over charges that it misled consumers by asking for reviews of their physicians without adequately disclosing that those reviews would be posted publicly online. 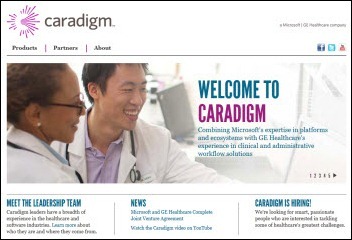 Microsoft and GE Healthcare complete the formation of their 50-50 join venture Caradigm. Allscripts nominates a three-member board slate to settle a lawsuit and proxy fight brought by key shareholder HealthCor Partners. Kaiser’s Oakland hospital gets hit with a $75K Department of Health fine for a 2010 incident in which nurses ignored a telemetry patient’s tachycardia alarms. Data analytics vendor MedAssurant changes its name to Inovalon. In the UK, Brighton and Sussex University Hospitals NHS Trust is fined $500,000 when hard drives containing the medical information of patients were sold on eBay. Healthcare management company MED3OOO becomes a major stakeholder in Scottsdale-based InteGreat Concepts. Allscripts and NaviMedix announce an agreement to provide Allscript’s eRx NOW ePrescribing solution to NaviMedix’s network of more than 190,000 physician customers. David Brailer launches a $700 million private equity fund, Health Evolution Partners. Walgreens licenses kiosk and EMR software from Ethidium Health Systems for use in its Take Care Health Systems retail clinics. Duke Clinical Research Institute concludes that extra pay does not improve hospital performance. I work in a company full of people who are almost all fantastic at their jobs. I try to identify the strongest skills in the people I work with most often, and then I emulate them when in relevant situations. As my assignments change, the people and skills I’m exposed to change, so I continue to develop further. They listen when I have a complaint – about life or work, they listen. Occasionally some wisdom comes back, but they mostly know just to listen and let me be heard. This week’s survey: Would you recommend to a relative or colleague that they switch careers to health IT? Why or why not? EClinicalWorks will pay $155 million to settle DOJ False Claims Act allegations. Tablet-based patient education and pharmaceutical advertising vendor Outcome Health raises $500 million. Ascension-owned Seton Healthcare (TX) goes back to paper after detecting suspicious activity on its network. 21st Century Oncology (FL) files chapter 11 bankruptcy. The VA’s IT budget is reduced as it grapples with the decision to either modernize VistA or implement a commercial EHR. Aviacode hires David Fong (Gebbs Healthcare Solutions) as VP of marketing and communications, and Jordan Stannard (IMedx) and Byron Triplett (Gebbs Healthcare Solutions) as regional sales executives. 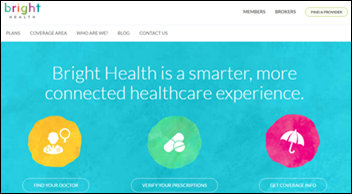 Health insurance startup Bright Health raises $160 million in a Series B round led by Greenspring Associates. Co-founded by former UnitedHealthcare CEO Bob Sheehy, the Minneapolis-based company works with health systems looking to package insurance plans with their clinical services. The University Of South Alabama Health System (AL) plans To switch from Siemens Soarian to a new Cerner EHR. Buchanan County Health Center (IA) switched from Meditech to Epic in March. Girard Medical Center (KS) outpatient clinics will go live with the Prognosis Ambulatory EHR in Q3 2017. Platte Valley Medical Center (CO) will switch from Siemens Soarian to Epic on May 30. Reaction Data publishes a new report on the UK imaging market. Carestream, Sectra, and Agfa Healthcare have the best foothold on enterprise business across the pond. 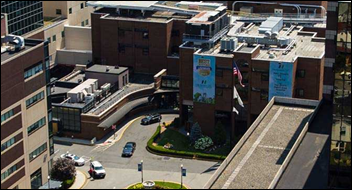 Hackensack Meridian Health (NJ) will add Cota Healthcare’s precision medicine technology to its five-month pilot of IBM Watson as a clinical decision support tool for oncologists. The trial will involve 10 physicians and up to 500 patients. Memorial Hospital (IL) will convert from Meditech to Cerner early next year. 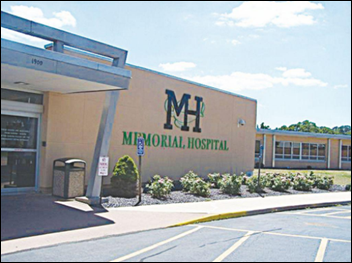 Lewis County General Hospital (NY) considers upgrading to Meditech 6.1. Director of Information Systems Robert Uttendorfsky anticipates that transition will cost at least $1.5 million and take 18 months. 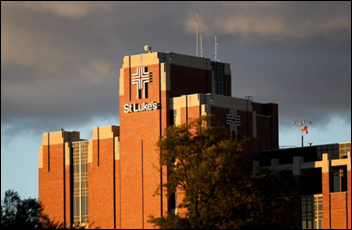 St. Luke’s Health System (ID) will deploy Voalte’s communications technology across its eight hospitals. The Queen’s Health Systems (HI) will integrate Recondo Technology’s ClaimStatusPlus with Epic. The organization got its start in 1859, when Queen Emma and King Kamehameha IV went on a door-knocking tour to raise funds for what would become The Queen’s Medical Center. It is the first (and perhaps only) health system in the US to be founded by royalty. 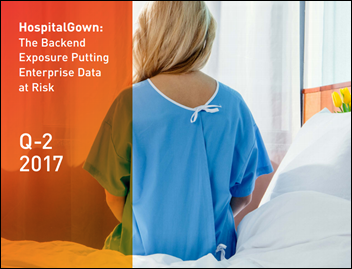 Appthority dubs a new backend data exposure risk HospitalGown, outlining in the cheekily titled report above the havoc it could wreak in enterprise environments. Identity management system company OneLogin experiences a data breach, putting the information of the Stanford School of Medicine (one of its biggest customers) at risk. An unspecified IT issue at The Cosmetic Institute in Australia causes a private index of patient data – including pre- and post-surgery photos, Medicare numbers, and other intimate patient details – to become publicly accessible via the surgery’s website. MIT Technology Review reports on 23andMe’s decision earlier this month to ask its customers for help in conducting research on pain tolerance. 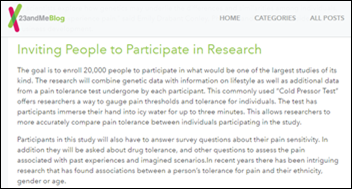 The consumer-friendly genetics company aims to enroll 20,000 people to take surveys on pain tolerance and pain history; 10,000 of those will conduct at-home cold pressor tests, where subjects stick their hand in ice for up to three minutes. The data will likely be used to inform studies on personalized pain medication. 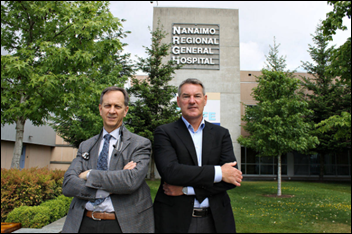 Doctors of BC President Alan Ruddiman, MD cites a “broken culture” at Island Health and its Nanaimo Regional General Hospital as one of the main reasons for continued physician dissatisfaction with the Vancouver health authority’s $135 million Cerner implementation. According to Ruddiman, such discontent has led to physician burnout and resignations – a state of affairs that will not only affect patient care, but the community, too. “If the medical personnel are hurting and they are uncoupling from this hospital then it’s only a matter of time where this gets known as a community that’s not an attractive place to live and work and that hurts everybody …” he added. The local paper casts Judy Faulkner-like aspirations onto VitusVet founder Mark Olcott, an entrepreneurial veterinarian working to make pet health records interoperable, and appointments and prescriptions easier to fill. Focusing on practices with four or more vets, the company hopes to pass the $1 million revenue mark this year after grossing a quarter of that in 2016. LogicWorks develops a new set of DevOps tools for running applications on the AWS cloud. NTT Data Services wins the “Deal of the Year” award for its acquisition of Dell Services. Clinical Computer Systems, developer of the Obix Perinatal Data System, PatientKeeper, and Wellsoft will exhibit at EHealth Canada June 4-7 in Toronto. Experian Health will host its Connect Health Conference June 6 in Chicago. The SSI Group will host a regional user group meeting June 6-7 in New York City. 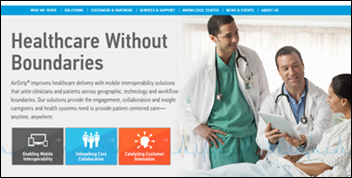 Surescripts and ZeOmega will exhibit at the AHIP Institute & Expo June 7-9 in Austin, TX. Versus Technology will host an open house at its new Bayside Education & Visitor Center June 7 in Traverse City, MI. Huron releases a video, Transforming Healthcare, featuring Harvard Business professor and author Clayton Christensen. Diameter Health publishes a new video featuring Chief Strategy Officer John D’Amore and Kansas Health Information Network Executive Director Laura McCrary. Encore, a Quintiles company, outlines what providers need to become Advanced APMs under MACRA in this white paper. * Start with the “why?” – what is the reason to do this (ideally top-down, for ex: establishing a data-driven culture to make data-driven decisions and to increase accountability, to increase data security and transparency)? This will start to establish some requirements as you noted (ex: HIPAA compliance, action item management for follow-up and accountability). * Now decide the “how” and explore all options such as hire your own, blend with vendor expertise, blend with a service provider, use a service provider exclusively. The how is technical and operations as you note. Organizing operations analytic talent in a distributed, distributed but coordinated, or centralized model – this depends on your culture and goals. – Technical options may include API like integration but often ETL is in bulk and there is a key decision to make between natively grabbing the transactional data or using the EHR vendor’s provided operational reporting store (ex: Epic Clarity, Cerner Healthe Analytics). Your analytics vendor should have recommendations and they may have predeveloped connectors to ETL from the EHR. If you look at API vendors, be sure this is their intended use of their tools and understand how they keep current with the EHR vendor’s changes to fields, data definitions and the like. Keep in mind how you capture the data can matter so you will need to determine how your EHR configuration and build team keeps the analytics team involved. – Technical options need to consider the full scope of work like data mastering to establish cross-references for providers, patients, locations and standard codes. Your analytics vendor may provide this. Other items to consider, how do you process or land data, manage metadata, and feed data to visualization and analysis tools. – Technical or Operations options should consider who manages or ‘governs’ data quality and who gets to prioritize changes that need to be made to minimize the need for the “T” in eTl (fix the front-end). – Technical or Operations options should consider who and how you will visualize and analyze data (who runs queries, builds reports and dashboards). Often a combined team exists until an organization really becomes proficient. * With all that decided, now look at the “how much?” There is no single or easy answer as there are so many variables (ex: your goals, constraints, existing maturity, data quality, use cases, ease of access to EHR data, access to hire and retain talent, how you handle project costs and ongoing costs). It should cost less than your EHR. Consider a discussion with some others who are further along in the journey. The Healthcare Data and Analytics Association (formerly known as HDWA) is a great resource. The Board Members are active and share. It is a great group that hasn’t been scourged by vendor money.